Equipment (L to R): 8 port remote antenna switch (AC0HB); Yaesu VX-6 HT; Heathkit SB-220 amp. (upgraded); Antenna switch; TelePost LP-500 Monitor & Yaesu Rotor control (below); SteppIR control & Intel NUC7i5 computer (above); Begali Simplex and Superex keys; FlexRadio 6500 transceiver (below); Elecraft XV-144 transverter (above); FlexRadio Maestro controller. There are some 750,000 FCC licensed radio amateurs ("hams") in the US and over 2 million worldwide. About half of US hams have gone beyond the entry level license to gain access to a wide range of frequencies and techniques to allow them to communicate across the world. Many hams are entering retirement and considering a move into a retirement community. What are the opportunities and problems of trying to continue in Amateur Radio in such a community? We are finding that a number of senior living communities look with favor upon the needs of the ham operator, either as a single operator from an apartment or as a member of a club of two or more hams. Administrators of retirement communities. 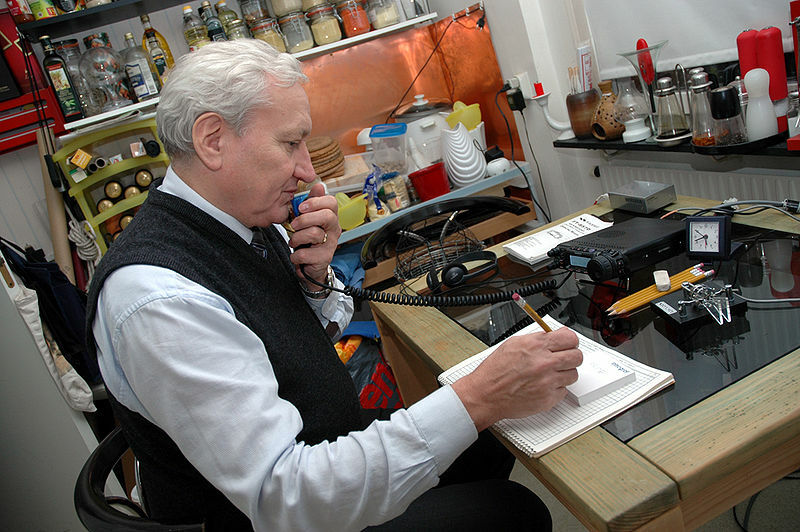 What is Amateur Radio? Who are the "hams"? Why would we want to support ham radio activities in our facility? Radio amateurs considering how to keep active with their chosen hobby after moving to a retirement community. What's a reasonable request for an antenna? How do I approach the management? How have other hams worked out these problems? AA6E will QSL (confirm contact or SWL reception) 100% on request. You may send your card direct or via the QSL Bureau. You may also QSL via the Logbook of the World (LOTW) (preferred), eQSL, or QRZ.com. Technology, communications, education, public service, a way of life? Amateur Radio (Ham Radio) has been around for 100 years and counting. You need to pass an FCC exam, and then the airwaves are yours -- in government-allocated frequency bands.